Sometimes it’s only when you’re back in the studio that you see. 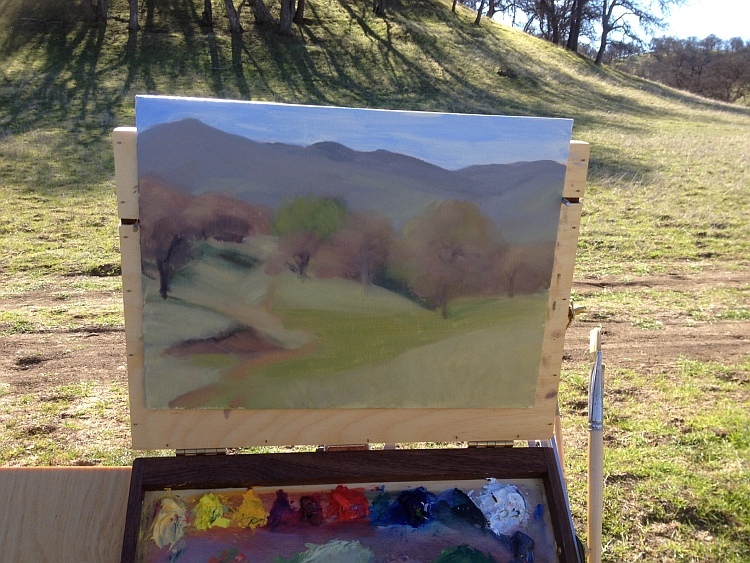 Plein air painting is a challenge: the light’s always changing; there are bugs and heat (or cold), etc., etc., etc. James Gurney recently posted a list and video on plein air painting disasters. Well, here’s another one: sometimes you don’t see the inherent weaknesses of your composition until you’re back in the studio. The original study for Mustard and Goldfields, on the easel. This one is too squished. At the Sacramento National Wildlife Refuge last month, they took us to a portion of the refuge not normally open to people. Which was fabulous and much appreciated. The day even cooperated a bit: the light got better as the high clouds started to move out. So I set up my easel under the canopy the refuge staff kindly set up for us on that unseasonably hot day* and went for it. I wanted to try to capture the wide expanse of the scene, the feel of the sun shining, the open sky. But I only had squarish boards: 9″ x 12″, 8″ x 10″. So I tried squishing the composition to fit the board. I thought I could get both ends of the composition and leave the middle out**. The image above is that first version, painted on site. Once I got back into the studio, I saw my experiment had failed. Oh, the day is warm, and the greens are close to right, but—eh. The painting doesn’t sing. So I changed the composition, after this time doing some value sketches. Here’s what I’m getting. This one’s not quite done yet, and as I look at the photo I can see things that need changing. But this larger one has much more the sense of the open space, the big wide world that I almost always want to portray in my paintings. I guess this is more reason to switch my plein air materials from pre-made boards to something I can manipulate—either cut or mount—later. So I can get the compositions better the first time round. AND be more rigorous about those doing those thumbnail sketches first! What are you looking for in landscape paintings? *or maybe this is the new normal in the Central Valley: almost no rain, and 90 degree days in April. **And yes, I can think of lots of other solutions NOW, back in the studio. A couple of weekends ago I got to be a 4th grader again. It was wonderful. Fourth graders in California are required to learn about California history. And while what I learned was decidedly a history of Europeans in California, it is true that you cannot separate the state’s history from the 21 missions built by the Spanish in the 18th Century. 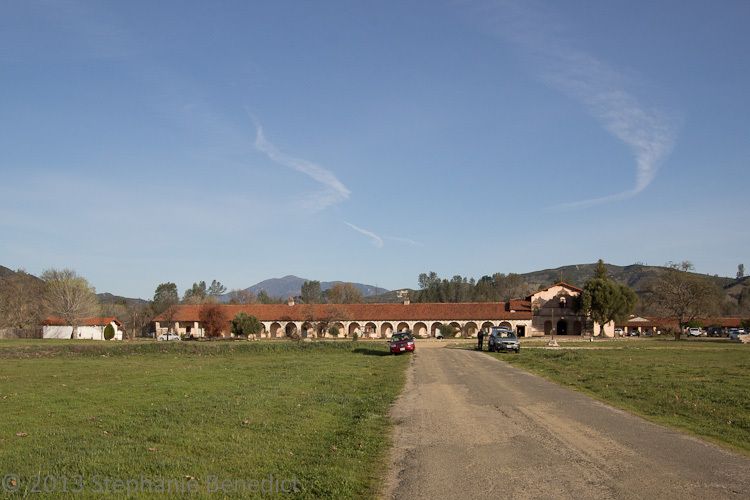 Mission San Antonio de Padua sits in the Valley of the Oaks in southern Monterey County. 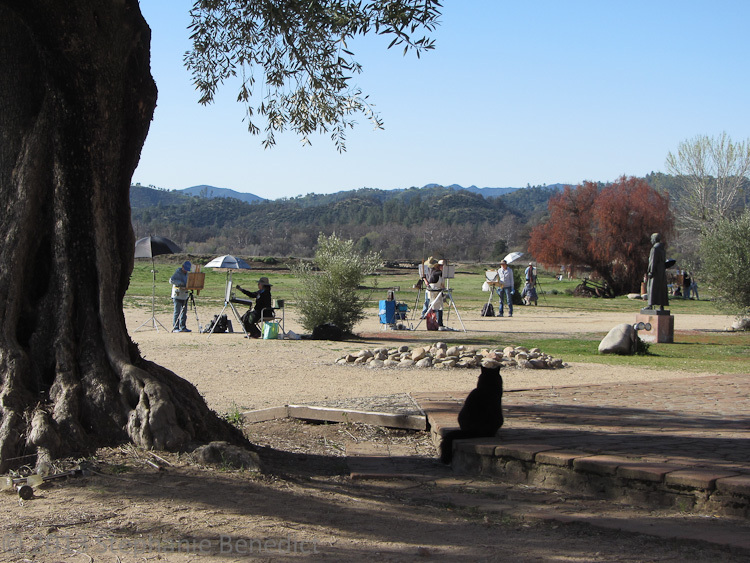 Rosario the Cat sits in the shade of a 180 year old olive tree and watches painters from the California Art Club. Mission San Antonio is the third mission to be established, originally in 1771 and moved to its present location in 1773. At its peak, the mission housed about 1,300 Salinan Indians. They grew grapes and made wine for church ceremonies, grew olives and made olive oil, had a tannery to tan hides for export back to the East Coast (readers of Two Years Before the Mast, by Richard Henry Dana, will recognize that part). The mission was abandoned late in the 19th Century, until the Franciscans returned in the 20th. Today’s structures are only partly original. The church’s roof collapsed in the 1906 earthquake, and other earthquakes and termites took their toll—so, while some original structures remain (such as the walls of the church), much has been rebuilt and fitted with things like electricity and indoor plumbing. What’s most amazing is that the land around Mission San Antonio has never been developed. Archaeologists have been working since the 1970s to locate and catalog the artifacts, so visitors today (many of them 4th graders) can see the foundations of the Salinan housing, the original wheat threshing floor, the grist mill and wine press (at least partially rebuilt) and tannery foundations. The remains of a millrace, built from Roman instructions in Latin, are still there. This preservation happened because the mission now sits in the middle of an active Army base, Fort Hunter-Liggett. The weekend we were there, some 4,000 soldiers were on base for training. The irony is that, when the mission was founded, the friars did not want a military presence there. And the painting? Well, it was definitely challenging. Many artists found painting the building’s archways in perspective during the short window of time one can work on a plein-air painting to be hard. And the adobe changed color every time I looked at it, from yellowish to orange-y to pink-y to dull reddish. (Not to say that all of these things can’t be fixed back in the studio!) So I can’t say I got any finished paintings—but I did learn a lot. A work in progress. This image shows how deceptive photos can be. I have another one that shows that wall in shadow much closer to the reddish color on the canvas. One final note. Mission San Antonio is in need of a seismic retrofit, which entails drilling through the adobe and installing steel supports. The cost will be about $12 million to $15 million. This tiny, but still active, parish has to raise the money itself. Here’s a link where you can donate money to preserve this important piece of California history. I hope you will consider donating to preserve this piece of California’s heritage. And if you ever visit Mission San Antonio—watch out for the rattlesnakes. The Yolo Art and Ag project for 2013 began this past month on a clear and windy Thursday morning in far western Yolo County. The lack of rain this year meant the roads were dry and the fields weren’t muddy, good for artists but also scary for the future. I love the opportunity to paint on private farmland where one would never otherwise be able to go. This time we went to a working cattle ranch the foothills that rise from the Central Valley to the Coast Range, near Lake Berryessa. The oaks haven’t leafed out yet—it is only February, after all!—but the grasses were trying to green up. This was the first layer, after about 30 minutes. I focused on the shadow colors within the trees and tried to get the distant hills. The shadows were the part that would change most quickly as the light changed. And the day was WINDY. We can get some pretty strong north winds here. This one was not quite a howler, but gusty enough to knock my hat off my head and to untie the plastic shopping bag I use for trash from my tripod and send it floating across the field. So painting was a race against the wind. My intention that day was to simply capture some of the color and value relationships before the wind grew too fierce to stand up in. I didn’t expect to make a painting: this was a sketch, information gathering, to come back into the studio with and perhaps make a painting from it. 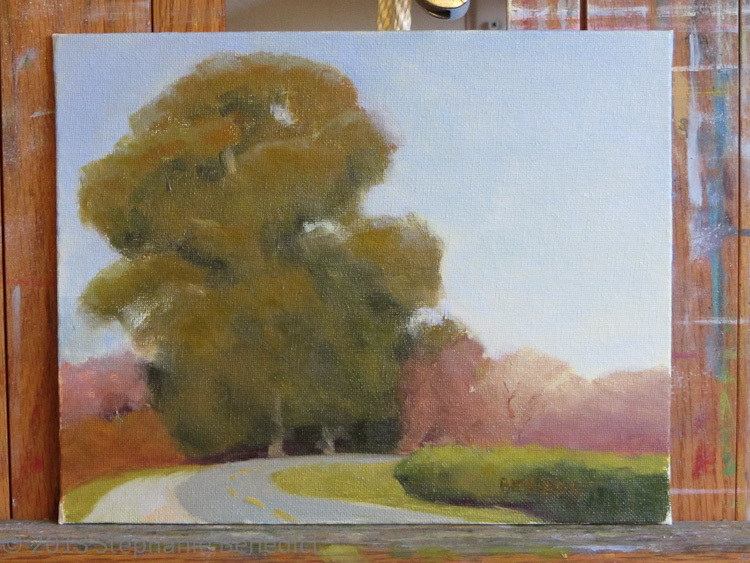 Those silver-gray oak tree boughs, with a bit of reddish new growth on the ends, are such a tough color to capture. All the dull colors of winter are challenging. Only the bright green new grass and the brilliant blue sky were bright and clear colors—all the others were subdued and very complex. But I’m actually starting to like the challenge of making such dull colors seem like they’re in light or in shadow. So I raced to cover my 9 x 12 board with something approaching the base colors I saw in front of me. After 30 minutes, I had it, and then I relaxed. I knew that, while I might not get any more detail that day, I had the basics on the canvas. Then I started over to refine and add some subtlety. Here’s the piece after 60 minutes. So, call this a quick study. After an hour I stopped. The wind hadn’t let up, the sun was actually getting warm, and the light was changing. Better to stop than to overwork it. 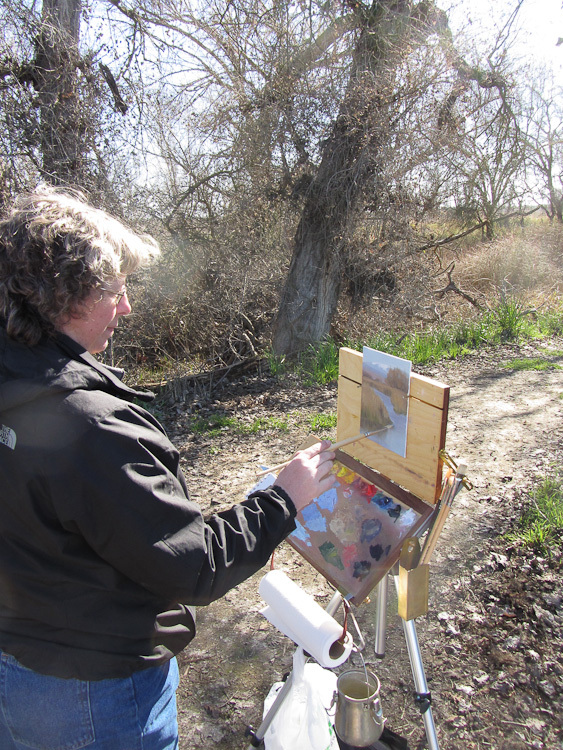 I recently had the chance to paint with friends at the Colusa National Wildlife Refuge, thanks to a Plein Air Painting day sponsored by the U. S. Fish and Wildlife Service. 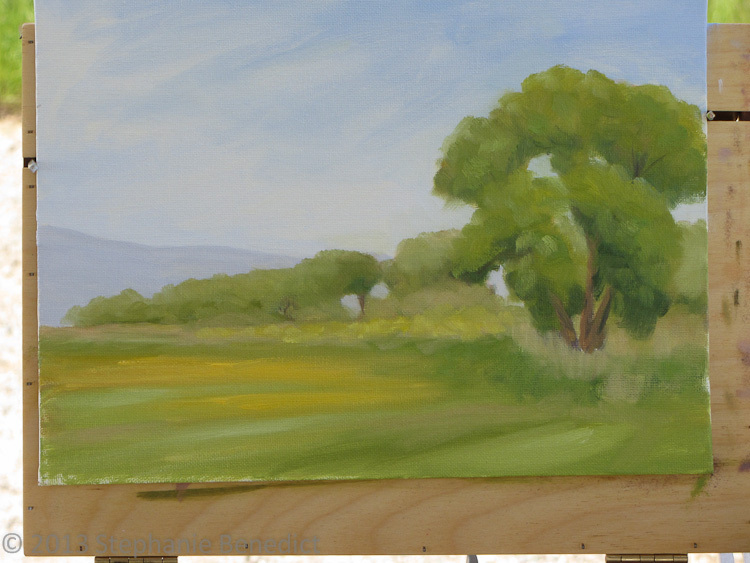 Wildlife artist Linda Merchant painting at Colusa NWR. 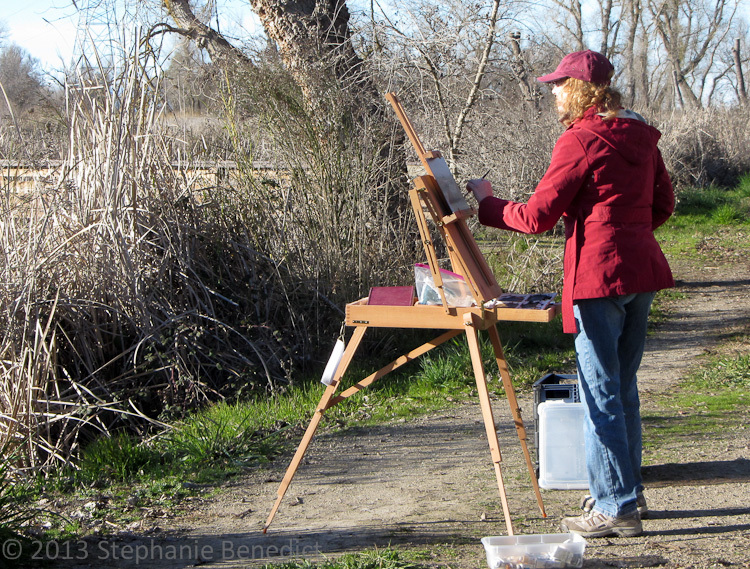 Here’s me painting at Colusa National Wildlife Refuge. I’d left my hat in the car–silly me. Photo by Linda Merchant. The refuge, located about an hour north of Sacramento, is one of a complex of refuges in the north valley that are the winter home of thousands of migrating waterfowl. In my humble opinion, these refuges are the jewels of the Valley—and, therefore, one of the best places to spend a sunny February Saturday. The group was limited to about 12 painters, most of who stayed close to the parking lot and the viewing platform. My friends Linda Merchant, Rhonda Egan, and I ventured a bit farther afield: perhaps a quarter-mile down a hiking path near a second viewing platform, where we could stand out of the wind and see the marshes and the Coast Range to the west. 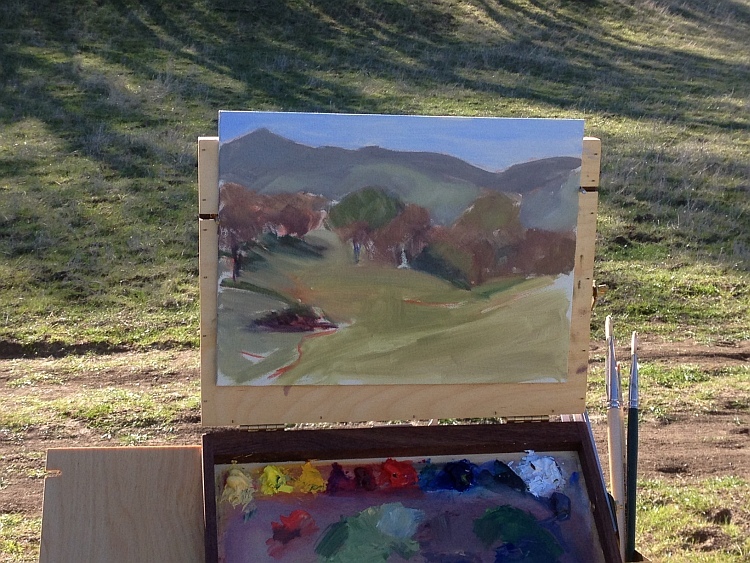 Here’s the deal with plein air painting that many non-painters don’t realize: just like photographers, painters like early morning and late afternoon light. Mid-day light, with the sun high overhead, is the harshest and, for painters, the flattest, because the shadows offer their least contrast at that time. It’s not impossible to paint mid-day: it’s just better earlier or later. So the three of us painted both morning and afternoon pieces: the first, done late morning; and a second later in the afternoon, after the official ending time of the event—but with light that just got better and better. The two photos above show two paintings done from almost the exact same spot, looking in different directions, at different times of day. The first shows the snow on Snow Mountain, almost directly west, in late morning. The second is late-ish afternoon, looking southwest. This one is a kind of contra jour (“against the day”) because I was looking almost directly into the sun. Thank you to the Sacramento National Wildlife Refuge Complex and the U.S. Fish and Wildlife Service for having this plein air painting event! 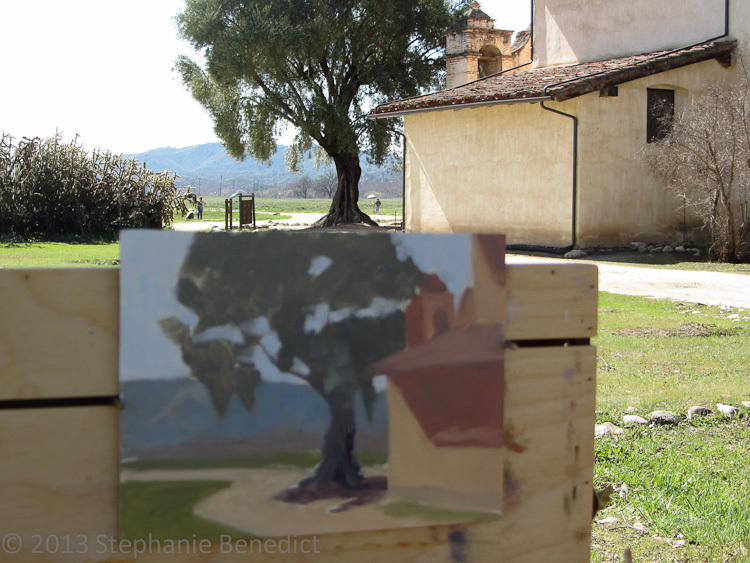 A few weeks ago I wrote about a plein air trip to the Sacramento River Delta. I finally had a chance to touch up the painting I did that day. Usually when you bring a painting indoors, you see things in it that need to be fixed: edges not right, some area too bright—something. This one had a shadow across that tree that was too much of a stripe, and the sky showed too many streaky brushstrokes. (I like the sky to be smooth, unless I’m painting clouds.) Here’s what I think is the final piece. Do you prefer finished-looking pieces, or the more raw look of a painting done in one outdoor session, with no touch-ups?